MAR is a biannual conference at which worldwide scholars, researchers and practitioners debate on cost and performance management in a wide range of business organisations, both in manufacturing and service. The Münster 2009 conference continues and evolves the themes established in the seminars held in Eindhoven (1993), Bruges (1995), Edinburgh (1997), Kolding (1999), Pisa (2001), Twente (2003), Tampere (2005) and Trento (2007). MAR conferences address issues like the adoption of new management accounting techniques in manufacturing and service, value chain analysis and inter-organisational cost management, biases in decision making originated by particular costing techniques, and performance management in operations. Moreover, the link between design and implementation of management control systems and the relevance to both theory and practice have always been perceived as crucial. The 9th MAR conference will comprise plenary presentations, concurrent sessions and a special track for PhD students. Some of the concurrent sessions will be allocated a discussant. The PhD track aims to promote young researchers and provides a platform for discussion of and individual feedback to PhD related papers. There will be an appointed discussant for each of these papers. The authors of the best conference papers will be invited to submit their papers to Management Accounting Research and will be subject to the journal’s double-blind review process. The conference is jointly organised by EIASM and the University of Münster, Chair of International Accounting. Please click HERE to download the main programme. Please click HERE to download the parallel sessions programme. Münster is well known for its beautiful city center and the large number of bicycles and students. The Prinzipalmarkt with the Lamberti Church and the City Hall housing the Treaty of Westphalia, as well as the Cathedral and the Market Square, are just a few of the internationally significant architectural monuments from the last 800 years. The city has about 280,000 residents. 50,000 of them are students that shape the face of Münster. The unique atmosphere of the city makes Münster one of the most liveable cities in the world, a title that was officially given to Münster by the international LivCom-Award in 2004. The city of Münster can be reached easily by plane, rail or car. Münster/Osnabrück International Airport (FMO) is located about 10 miles north of the city center of Münster. Outside the FMO airport arrival hall, you can take a shuttle bus (D50 or S 50) heading to Münster main station. The bus ride takes approximately 35 minutes. Taxis, available outside the arrival hall, take you in about 25 minutes to the city center for about 40 Euro. Münster/Osnabrück (FMO) is connected directly to Frankfurt (FRA) and Munich (MUC) Airport via AirBerlin and Lufthansa/Eurowings. Instead of domestic flights, Fly&Rail tickets offered by Deutsche Bahn together with international airlines are an alternative. Münster can also be reached by train from Düsseldorf (DUS) and Amsterdam Schiphol International (AMS). Both airports are about 100 miles away from Münster and have excellent train connections. Münster is well connected with other cities by train. To find your connection, visit the website of Deutsche Bahn. Münster can be reached via highway A1 (from Bremen or Dortmund) and A 43 (from Recklinghausen). Click here to download pictures of the conference! The conference will start on Sunday, June 21, 2009, at 18.00 h with an Early Bird Reception. The academic programme of the conference will start formally at 9.30 h on Monday, June 22, and is scheduled to end at approximately 13.00 h on Wednesday, June 24. The Early Bird Reception will take place at the University of Münster. The main conference is held at the Mövenpick Hotel Münster (Kardinal-von-Galen-Ring 65, 48149 Münster, Germany). A number of rooms have been reserved in the hotels below for the conference delegates. The location of the hotels can be viewed HERE . Please mention the keyword “MAR-Conference” when booking a room. 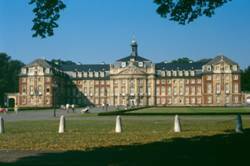 The fares are reduced according to an agreement between the University of Münster and the hotels. Each hotel has its own reservation deadline, which we kindly ask you to pay attention to. Many of the hotels below do not have a large number of rooms reserved for the Conference, so please make your reservation as soon as possible and preferably well before the deadline. Mövenpick and Kaiserhof are both comfort hotels. The Mövenpick Hotel is the conference venue. It is more expensive and more upmarket than Kaiserhof. Whereas Mövenpick is located within 25-30 min. walking distance from the city center, Kaiserhof is located nearby Münster’s main station and very close to the historic center. Agora, Ibis and Stadthotel are standard hotels. The Agora hotel is the simplest, but offers the largest rooms of the standard hotels. Ibis on the other hand provides smaller rooms that are modernly furnished. The Stadthotel is almost as large as the Agora hotel and almost as modern as the Ibis hotel. In addition, the three hotels differ in location. For further details, please visit the website of the hotels. Cancellations made before June 1, 2009 will be reimbursed minus 20% of the total fee. No reimbursement will be possible after that date.